Matt Fouch, a nationally renowned professor of seismology in the ASU School of Earth and Space Exploration (SESE) has moved to the Dept. of Terrestrial Magnetism, Carnegie Institution of Washington, in Washington DC, as a Staff Scientist. 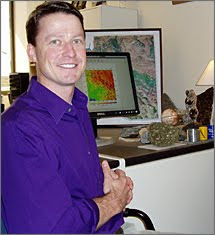 Matt has been a leader in the IRIS Consortium and is currently Chair of the EarthScope/USArray Advisory Committee. Some folks need their morning joe to get going but if you hang around Lake Mead, it seems like you'd be getting used to a morning jolt. At 7:22 local time, they had a magnitude 2.1 event (in red at right). On Monday morning, it was a 2.3 quake (in yellow at right). "The Bureau of Land Management's Resource Advisory Council voted 9 to 2 to recommend to U.S. Department of Interior that more than 1 million acres of land surrounding the Grand Canyon remain open to mining claims," according to a story in the Kingman Daily Miner. We had heard reports of this but Mohave County Supervisor Buster Johnson issued a press release after attending a RAC meeting last week. 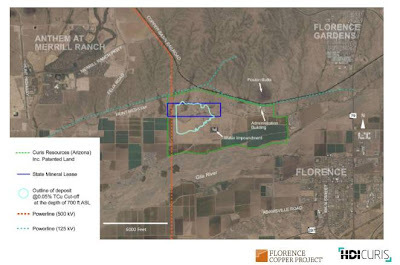 The debate over a proposed in situ copper project in Florence has turned to conflicting reports on the potential for home building in the area. The SanTan Valley Today paper reports that "Southwest Value Partners, the California-based real estate investment firm behind the opposition Protect Our Water Our Future effort, issued a commissioned housing study on Aug. 22 that contends Phoenix metro-area foreclosures are dipping and job creation is recovering which will lead to greater future demand for new homes in Florence and surrounding areas." This counters a study issued by copper company Curis Resources that concluded "there will be no need for additional lot development as it projected a four-decade supply in active, dormant, future-platted and announced future subdivisions in the surrounding area." Owners of surrounding parcels fear loss of value of their lands for residential and commercial real estate development and are fighting the copper project. Curis calculates the project area contains an estimated 2.84 billion lbs of copper and will produce 76-86 million lbs per year in full operation. 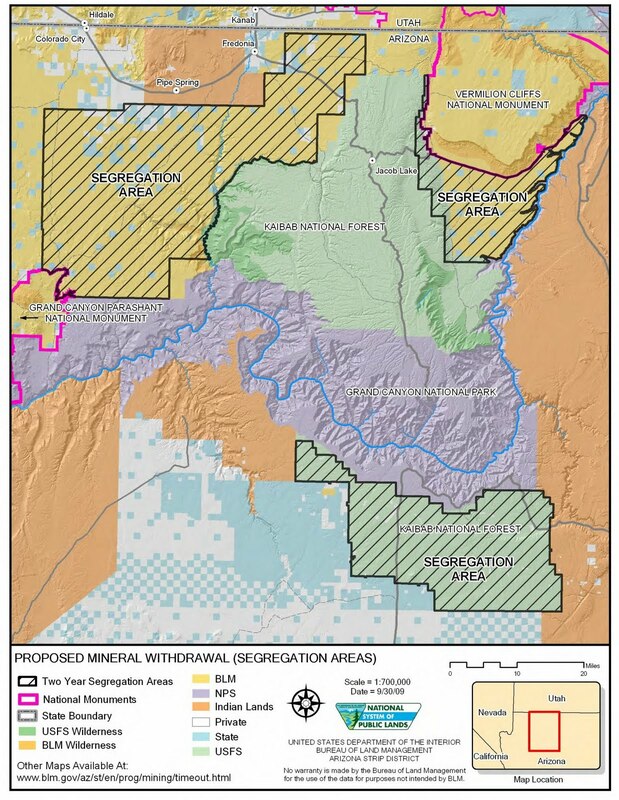 The Arizona office of BLM released a Draft Resource Management Plan and Environmental Impact Statement for 1.4 million acres in southwest Arizona that includes the potential for utility-scale solar power plants and other land use alternatives on mineral development, recreation, and wilderness designations. 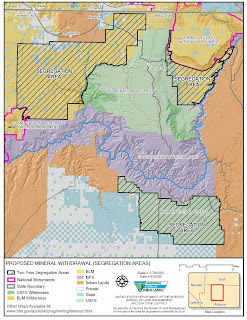 BLM is taking public comment on the plan alternatives until Nov. 25, 2011. "Those interested in a wide range of resource issues, such as livestock grazing, hunting, target shooting, off highway travel and access management, wilderness characteristics, wildlife, and utility-scale renewable energy and utility corridors are encouraged to review the draft plan and participate in this public process. 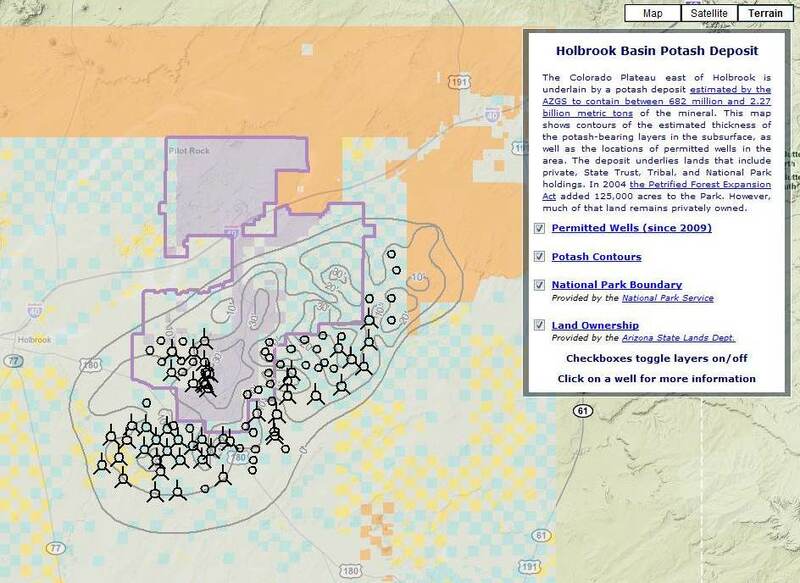 The Draft RMP/EIS will be available for review online next week at: www.blm.gov/az/st/en/prog/planning/son_des.html." Arizona experienced another small quake, magnitude 2.1, this morning around 8:30 am local time under Lake Mead along the Nevada border. It's in the same area as other, similar sized quakes have been occurring since this spring. 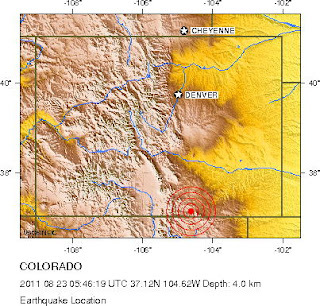 At 11:46 PM MDT on August 22, 2011, a Mw 5.3 earthquake was recorded by U.S. Geological Survey seismometers and located the epicenter approximately 9 miles (+/- 7.8 miles) WSW of Trinidad, Colorado. 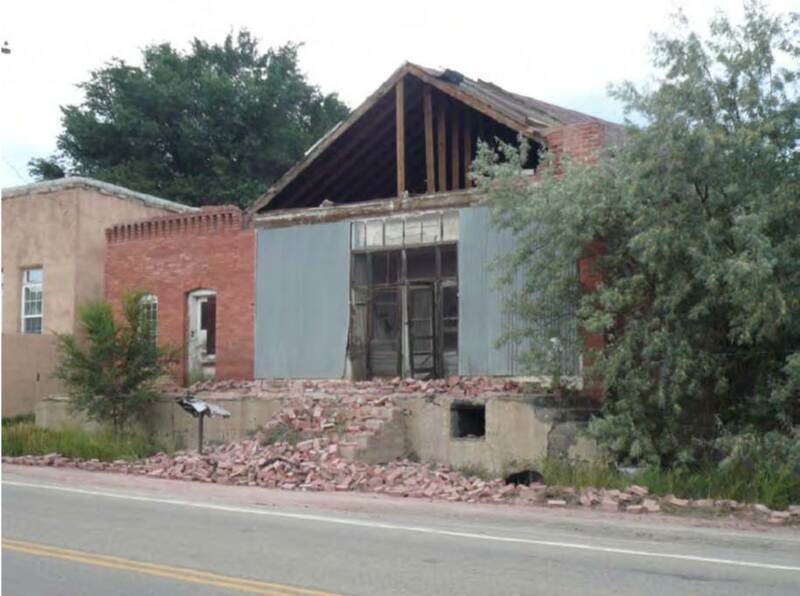 Early reports by local news media indicated that significant damage to buildings had occurred in the towns of Segundo and Valdez, 15 miles west of Trinidad on Colorado State Highway 12. Prior to the Mw 5.3 event, three smaller events were also recorded in the same vicinity, the largest being an Mw 4.6 event at 5:30 PM MDT. On the morning of August 23rd, the Colorado Geological Survey dispatched geologists to the area to document the damage related to the largest earthquake in Colorado within the last 44 years. Locations with observed structural damage included (from most severe to least): Segundo, Valdez, Cokedale, and Trinidad. 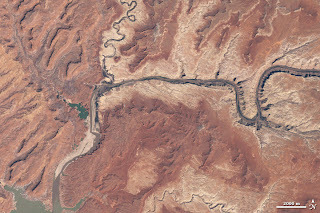 Arizona's alluvial basins have suffered an overall storage loss of 74.5 million acre-feet of water since their development began, according to a study published by the USGS, representing both gains and losses to from the groundwater system. "Groundwater withdrawals accounted for the largest share of the water budget, with nearly 2.4 million acre-ft per year withdrawn from the study area in recent years. Evapotranspiration from groundwater was estimated at nearly 1.3 million acre-ft per year" from the more than 73,000 square miles of alluvial basins in Arizona. 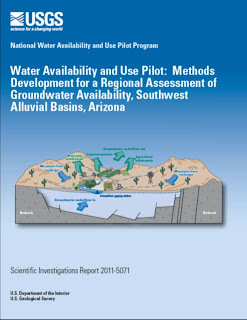 Ref: Tillman, F.D, Cordova, J.T., Leake, S.A., Thomas, B.E., and Callegary, J.B., 2011, Water availability and use pilot; methods development for a regional assessment of groundwater availability, southwest alluvial basins, Arizona: U.S. Geological Survey Scientific Investigations Report 2011-5071, 118 p. and online appendix. The possible Earth fissures on Van Ness Rd in Cochise County have grown dramatically since the beginning of the month. AZGS geologist Mike Mahan reports that the west segment extended 183 feet between August 5 and August 19. The east segment extended a further 239 feet. Analysts with Macquarie Research make the case that copper supply shortages will lead to higher prices. 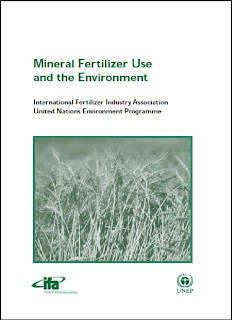 "Since 2004, only around 1.45 million tons [per year] of new supply have been brought online." A decade ago, predictions were for addition of more than 7 million tons of produce but only about 20% of that has actually under construction or operational according to the study. In a financial presentation at the end of June, Freeport McMoRan Copper & Gold shared the figure at bottom right, showing that while stocks of copper have risen in the past two years, they are still well below historical amounts. 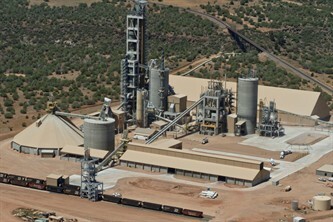 Freeport projects production of 1.2 billion pounds of copper in 2011 from its U.S. operations, primarily in Arizona. "None of the funding is guaranteed, and no major congressional earmark or other funding source is expected. Only one flood area out of about six drainage areas has explicit, well-defined flood-control plans -- the rest are yet to be decided. 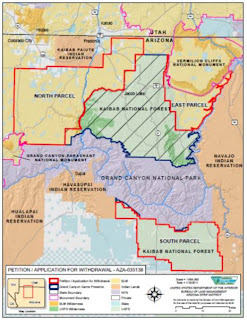 And all of the solutions rely on the U.S. Forest Service taking action to channel water from the Coconino National Forest (a step it has not promised)." Six of the Arizona Cardinals cheerleaders are pursuing science or engineering careers and took questions online last week about their stereotype-breaking lives. Darlene Cavalier, the original Science Cheerleader, and my colleague at COPUS, organized the online event with the culmination being a video interview of the Cardinal scientists and engineers answering the questions last week. As soon as that is posted, I'll put out a notice. There's a Arizona Cardinals page on the Science Cheerleader website, along with links to the other teams that include 100+ women scientists and engineers who also are cheerleaders. 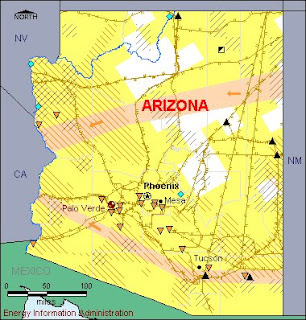 AZGS has published a set of guidelines for investigating land subsidence and earth fissure hazards in Arizona, that was compiled by the Arizona Land Subsidence Group. The AzLSG is an informal organization of geologists and engineers from industry, academia, and government who meet monthly to review and discuss technical issues. 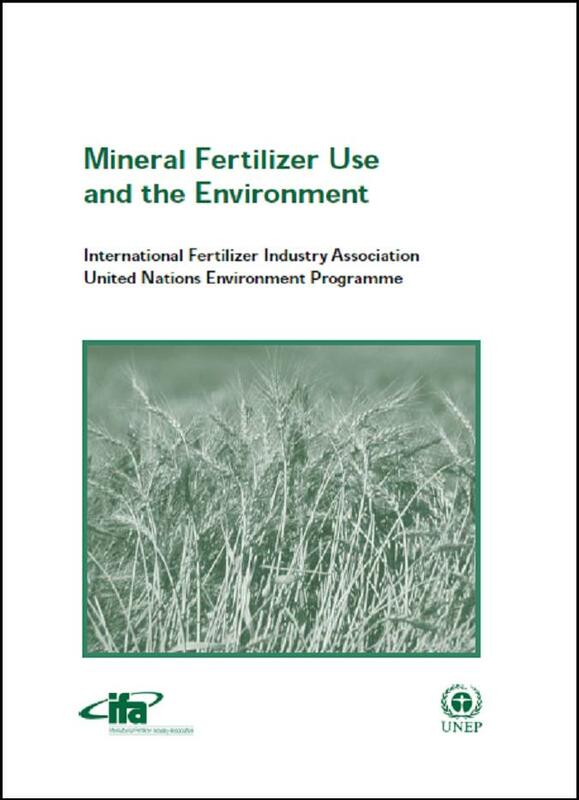 The report is online for free downloading or viewing. These guidelines provide professionals evaluating site-specific conditions in areas known or suspected to be subsiding with a standardized minimum level of investigation for land-subsidence and earth-fissure hazards. The guidelines do not include systematic descriptions of all available investigative techniques or topics, nor is it suggested that all techniques or topics are appropriate for every project. Variations in site conditions, project scope, economics, and level of acceptable risk may require that some topics be addressed in greater detail than is outlined in these guidelines. However, all elements of these guidelines should be considered in comprehensive land-subsidence and earth-fissure hazard investigations, and may be applied to any project site, large or small. 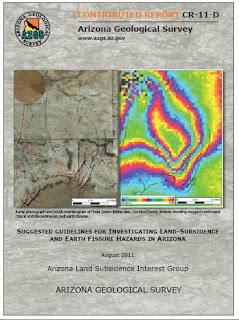 Ref: Suggested Guidelines for Investigating Land Subsidence and Earth Fissure Hazards in Arizona, 2011, by the Arizona Land Subsidence Interest Group, Arizona Geological Survey Contributed Report CR-11-D, 10p. But the article concludes that the short term outlook for uranium demand and prices is "clouded" because supplies from decommissioning nuclear warheads will continue into 2013. However, if most of the nuclear power plants proposed around the world continue, and proposed uranium mines are delayed or cancelled, there could be a uranium shortage. This relevant to Arizona because mining opponents argue that plentiful alternate sources of uranium exist to the deposits in northern Arizona, so the land can and should be withdrawn from exploration and development. Mining advocates argue that Arizona's deposits are some of the richest and most extensive in the nation. 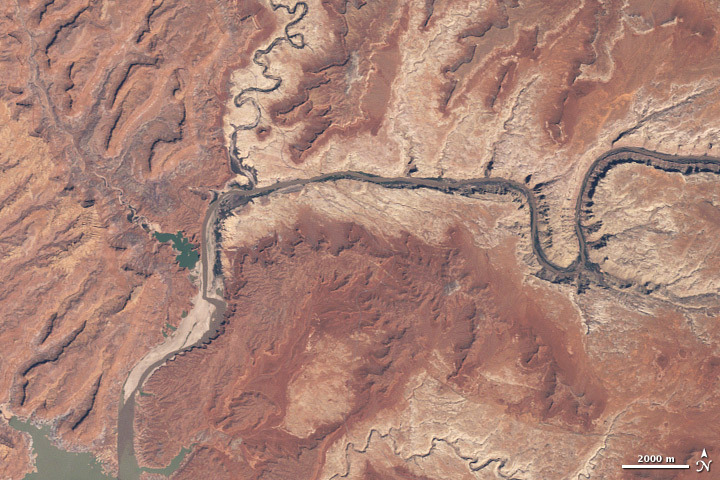 The USGS issued three reports on the potential for post-fire floods and debris flows areas burned by the Wallow, Monument, and Horseshoe II wildfires in Arizona. Along with the reports, the USGS announced that "Working with the U.S. Forest Service and Cochise and Apache Counties, the USGS has installed new flood-warning gages in areas affected by recent flooding. The flood-warning gages will transmit by satellite a warning when the stream level reaches a predetermined height or when the water level changes rapidly." 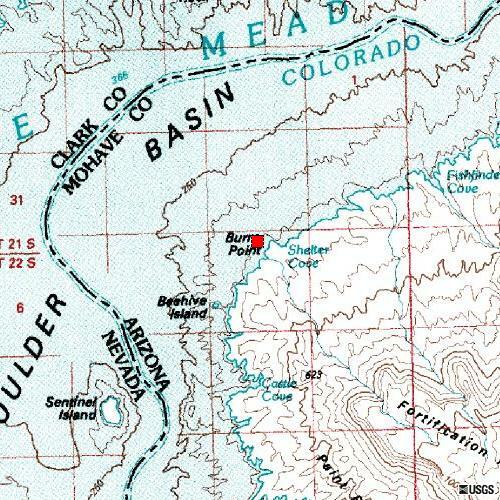 "The location of the sites should give us 30-40 minutes advance warning if a major increase in runoff occurs," said Apache County Chief Deputy Brannon Eagar. "We’d liked to have more advance notice, but the lay of the land just wouldn’t permit it. In an emergency situation, every minute counts, and we’re grateful to have that advanced notification." The data collected by the USGS are used by the National Weather Service to issue alerts and identify dramatic runoff changes in a given watershed. After watching this, all the AZGS geologists here want one of these to use for field work. Scotia Bank analysts say there are supply deficits (ie shortages) of copper and potash worldwide, that are pushing up potash prices substantially, and will exist for copper through 2012. 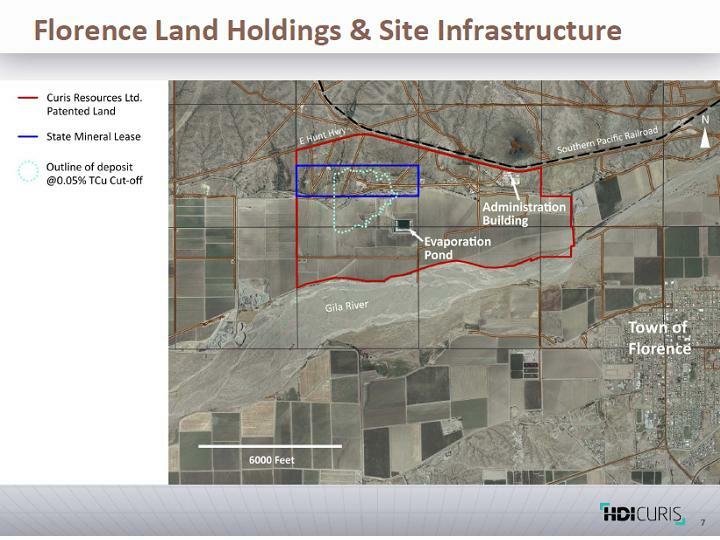 Arizona's Holbrook basin is emerging as one of the more exciting potash areas in the world with significant exploration programs underway by three companies. She says, "Copper remains in a supply deficit, that is world refined consumption exceeds supplies-a development expected to last through much of 2012." Arizona produces nearly 2/3 of the copper used in the U.S.
After briefly topping $1900 an ounce on Monday, gold has dropped steadily for the past two days, closing at $1754 [right]. Silver has taken a proportional price hit as well. But copper, the lifeblood of Arizona's mineral industry, has been hovering pretty steadily around $4 per pound, plus or minus a few cents. Copper is more indicative of global industrial activity, rather than as a currency hedge. 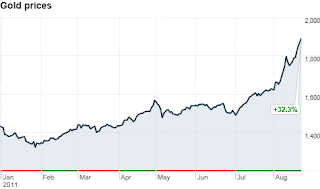 Some pundits were predicting gold rocketing to $2000 or more due to economic uncertainties, but others have been warning of a market correction. So, is this a correction, or response to positive developments in the economic sector? The statutory authorization for the Arizona Geological Survey ends June 30, 2012. The Arizona Legislature is beginning a Sunset Review of AZGS to determine if the agency should be continued, revised, consolidated, or terminated at that time. This is standard procedure for all state agencies, commissions, and boards. A Committee of Reference has been formed, co-chaired by Sen. John Nelson and Rep. Kate Brophy McGee, that is reviewing AZGS goals, objectives, and accomplishments. The committee will make a recommendation to the full Legislature no later than December 1, 2011, on our future. The Legislature will then take action when they convene in January 2012. The Survey could be extended for up to 10 years. AZGS responded this week to a set of 17 questions from the Committee about our efficiency, productivity, achievement of goals, and possible options to privatize Survey functions, or consolidate AZGS with other state bodies. 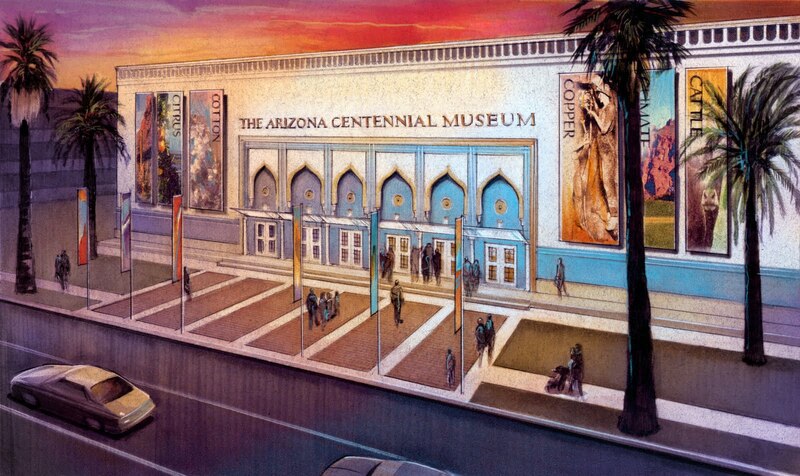 The Committee of Reference will hold at least one public hearing on the future of AZGS, probably in September or October. This will allow an opportunity for you to weigh in with your opinions or recommendations about the Survey. I'll post updates here and on the AZGS web site about the hearing date and developments. It's heading towards a record 108F here in Tucson today. Everyone is looking for a cool shady spot to sit it out until evening. This coyote found a suitable spot under the rosemary and bird of paradise just outside our backdoor at home this morning. The log at right is petrified wood from Wyoming. It's hard to get much attention for our puny magnitude 2.0 earthquakes near Lake Mead, when the nation's capitol is still ringing from yesterday's M5.9 event. But we had another one this morning at 10:45 AM local time. No reports of cracks in Hoover Dam or evacuations of high rises in Boulder City. Animation of Virginia quake waves rolling across the U.S. 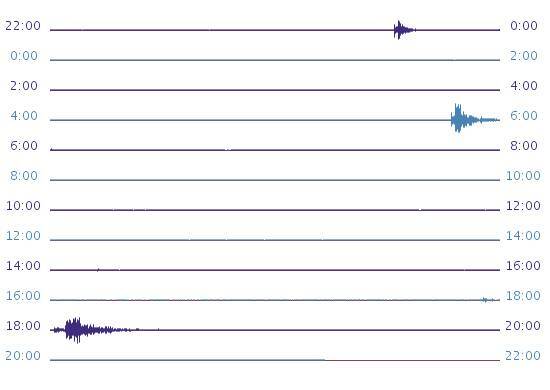 The IRIS consortium posted this animation of the wave train from today's 5.9 Virginia earthquake as it rolls across the U.S., recorded by seismographs. The big batch of instruments in the center of the country is the current deployment of stations in the USArray network, a 10-year long NSF EarthScope project to image the crust. The stations started on the West Coast and are rolling across the country, staying in one location about two years before moving eastward. 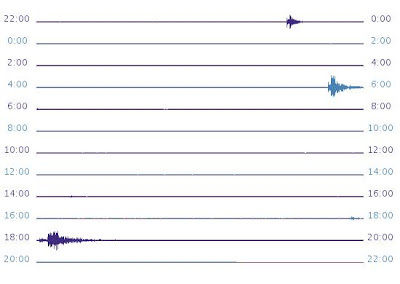 The Colorado (M5.3) and Virginia (M5.9) earthquakes were both recorded on stations in the Arizona Broadband Seismic Network, run by AZGS. At right, is the record from the Snowflake AZ station, showing the Colorado event just before 6:00 UMT and the Virginia event at the bottom around 18:00 UMT. The RI State House (structure with very large dome) evacuated when shaking felt. It is situated on an uplifted glacial lake delta underlain by lakefloor varves. In New Hampshire, one person said she was on third floor of state office building and lights swayed and desks shook for 30 second. That entire building is build on 150+ feet of unconsolidated glacial sand, and near the terminus of the former delta. Many reports [of ground shaking] from southern and coastal Maine, mostly in areas underlain with glacial-marine mud. New York State Museum in Albany built on lake clays experienced moderate shaking. Most areas in Maine reporting shaking from this event are underlain with thick sequences of glacial-marine mud that amplify seismic shaking. Thus, firm knowledge of the distribution of such units is essential to risk analysis. The reduced attenuation of seismic energy in our older, colder crust means much larger areas can be affected by moderate seismic events. Phones ringing off the hook in State Geological Surveys in Massachusetts, New York, Ohio, Virginia, Maryland, etc. 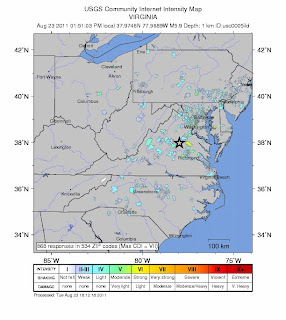 A magnitude 5.9 earthquake in Virginia was felt up and down the East Coast with preliminary reports of it being felt as far away as Boston. The event was between Richmond and Charlottesville, about 83 miles SW of Washington DC. It occurred at 1:51 pm local time (EDT). Intensity is reported as 'strong' in the epicentral area. It's apparently the largest quake in Colorado since a magnitude 5.7 event in 1973, north of Grand Junction in western Colorado. 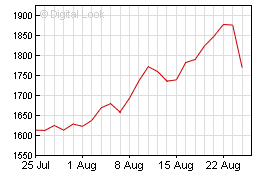 Interestingly, even with such a dramatic runup in gold prices, it looks like silver was heading up at a faster clip. This might be because the gold/silver price ratio was rising or that investors spooked by the high price of gold are looking for cheaper commodities. Arizona has one operating gold mine and another expected to start production shortly. Gold is also produced as a by-product of copper mining here. We're starting off the work week with a magnitude 1.9 earthquake just east of the Arizona-Nevada border near Lake Mead and Boulder City, at 7:29 AM local time today. A group of real estate developers opposed to the Florence Copper Project met with Gov. Brewer's staff and heads of state agencies on Wednesday, to make their case that the in situ mining project would harm the value of their planned housing and commercial developments, according to a story in the Yellow Sheet (subscription required but a version is posted online). We are still unsure if extensive cracks in Van Ness Road in Cochise County are earth fissures or giant dessication cracks, but to residents along the private road, they don't care what it is. They just want it fixed to make the road safe for drivers. The county however, argues the road is private and not the responsibility of taxpayers to repair. Here's a news report from Tucson's KVOA on the situation. But newspaper stories increasingly describe real estate developers as being the primary opponents to Curis Resources mining plans. 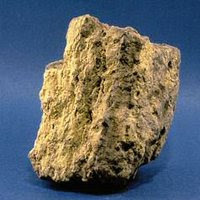 The reason is repeatedly stated as fears of reducing the value of properties near the mine site. An article from Arizona Guardian says representatives from Southwest Value Partners, "an investment group owned by Phoenix Suns owner Robert Sarve," are meeting with the Governor's staff to urge her to oppose the mine over their fears of financial impacts to their housing and commercial developments. Gold is at $1821 this morning, surging dramatically from yesterday's closing price. Silver jumped as well, currently at $40.52. 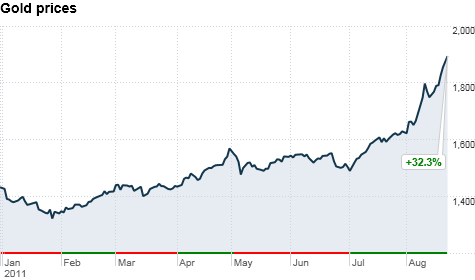 Some analysts are calling for gold to hit $2000 this year, but others warn of a 8-15% price correction. AZGS is publicly demonstrating for the first time, the potential of the National Geothermal Data System at the Geothermal Summit being held in Reno, Nevada today and tomorrow. 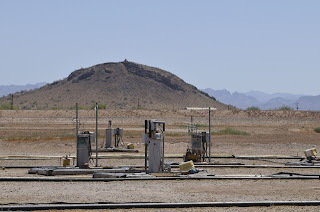 AZGS is the prime contractor on a DOE funded project to bring digital data from all 50 states into NGDS to support geothermal energy exploration and development nationwide. The Summit is addressing concerns that the U.S. is not taking advantage of the vast geothermal resources we have, and that we are falling behind other countries in pursuing this renewable energy resource. There was another small, magnitude 2.1 earthquake a few minutes ago under Lake Mead on the Nevada-Arizona border. We continue to suspect this is due to the load on the rocks under the reservoir as the late, and large, snowpack runoff in the Rockies is filling the lake. Arizona ranks 27th in the nation in total energy production with 571 trillion Btu's in 2009, out of 72,640 TBtu's total. Texas is #1 at 11,915 TBtu's. These numbers and more from the US DOE Energy Information Agency's State Energy webpage. 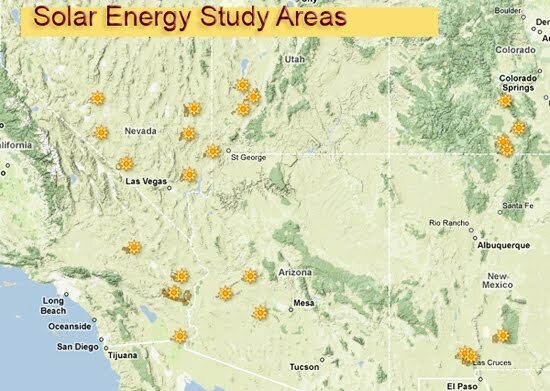 The Arizona page includes an interactive map [right], showing power plants and fuels, transmission lines, coal mines, and potential for renewable energy. Lake Powell is at its highest level in a decade, plus Lake Mead is 20 feet higher than a year ago, and it's expected to add another 33 feet by next August. 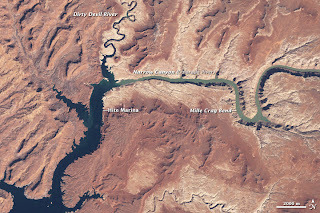 The Las Vegas Review Journal enthused that "Last month's inflow ranked as the second largest Lake Powell has ever seen in July. The 4.35 million acre-feet of water that poured into the reservoir on the Utah-Arizona border that month was almost three times the July average, and the flow in June was even greater -- 5.4 million acre-feet, or almost 24 times the amount of water used in the Las Vegas Valley all of last year." 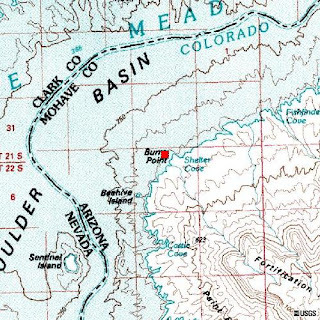 Colorado River water is also carried by the Central Arizona Project canal to both Phoenix and Tucson metropolitan areas. 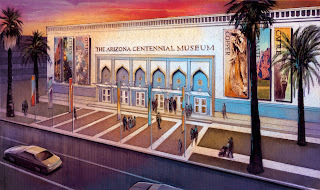 Madison Barkley is the newly hired Geology Curator for the "Arizona Experience" [right], the planned reincarnation of the former Arizona Mining and Mineral Museum, as part of the 2012 Arizona Centennial. Madison recently completed her PhD in Geosciences at the University of Arizona, under the direction of Bob Downs, who is also the Director of the UA Mineral Museum at the Flandreau Science Center. Madison told me she plans on keeping a research office at UA. Bob has been enthusiastic about the possibilities of developing joint exhibits, education programs, and other resources for the two museums. Madison's appointment may be the key to help make that happen. 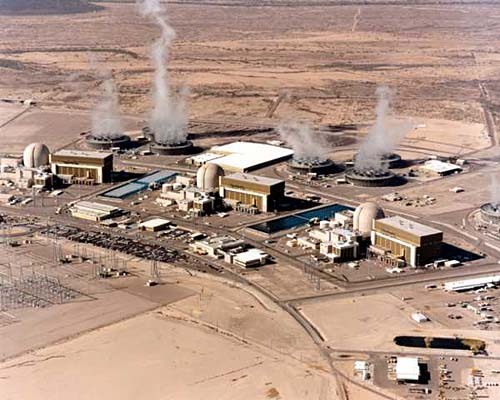 Should the emergency evacuation zone around Palo Verde Nuclear Generating Station [right, photo credit AZ Public Service] be increased from 10 miles to 50 miles, as the U.S. called for around the Fukushima plant in Japan? That provocative proposal is discussed in a feature article in today's Arizona [Phoenix] Republic. 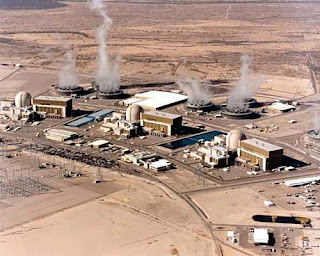 PVNGS is not subject to tsunamis, is located in one of the lower seismic risk areas in Arizona, and is of a different design than Fukushima. But the national discussion since the Japan earthquake is how to prepare for the unexpected. A 50-mile radius reaches to downtown Phoenix and covers millions of residents. 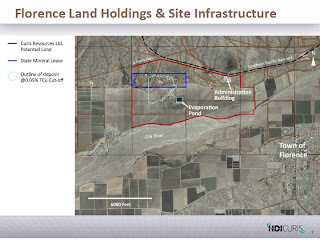 In one of the first public discussions of its exploration program in Arizona's Holbrook basin, Pat Avery, CEO of Denver-based American West Potash, described their preliminary plans. In an interview in the Arizona Journal, Avery said their drilling results are confirming the analyses in the 2008 AZGS report on the deposit. He proffered that the nature of the deposit and the existing infrastructure of rail, road, and power make this a first class deposit that can compete with any other mine in the world. Arizona has historically touted its 5 'C's - cotton, citrus, climate, cattle, and copper - as the key elements of culture and economy. But today I heard half jokingly, that there is a 6th C - cement. I was a lunch speaker at the Arizona Mining Alliance meeting, talking about potash, and one of the participants quipped about cement. Up until the past few years, I think you could make that argument. With Arizona as the # 1 or 2 fasted growing state in the nation, and the heavy concentration of the economy on housing construction, cement trucks filled the highways. The New York Times quotes Arizona congressmen Raul Grijalva and Ed Pastor as saying they expect the U.S. House to take up the issue of uranium mining on federal lands in northern Arizona after Labor Day, when the House reconvenes after their summer recess. There is a rider in the Interior and EPA appropriations bill that would overturn the Secretary of Interior's proposed 20 ban on mining in the region. 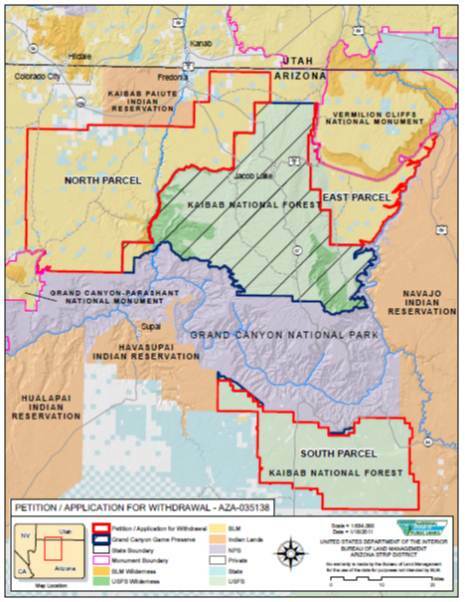 The debate over mining outside the boundaries of Grand Canyon National Park has become increasingly politicized since the Secretary made his decision before comments had been received on the BLM's draft EIS [right, map of the withdrawn areas. Credit, BLM]. On a phone call I had with BLM Deputy Director Mike Poole and other Interior officials the day of the decision, they were forthright in stating that neither they nor the Secretary had read much of the substantive comments from cooperating agencies in the EIS before making the decision. They also admitted that while they have been to the Park, neither they nor the Secretary have been to the lands proposed for withdrawal. They referred to 300,000 mostly pre-printed postcards received, as a basis for opposing mining in the area. Subsequently, Rep. Jeff Flake introduced a rider into the Interior Approps bill in committee, that would overturn the Secretary's ban. That is winding its way through the process and has become the focus of the battle with a strongly partisan division. The BLM EIS process continues, and AZGS is a cooperating agency. But the pessimist in me questions how much effort to put into a process where the outcomes are driven by politics and not the science. 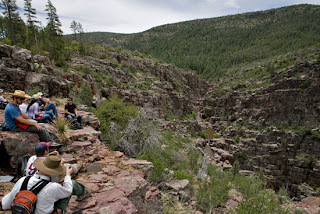 ASU posted a nice gallery of photos of summer geology field camp being held near Payson, Arizona, along with other geology field projects around the state. 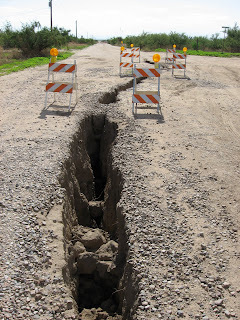 I received a link today for a blog that reprinted the recent Willcox Range News story of giant cracks along Van Ness Road in Cochise County (The blog also reprinted the AZGS photo of the fissure at right, without any attribution or credit). Apparently, this is viewed as another piece of evidence of the impending doom facing the Earth. There is an active online community proposing that the Earth's magnetic poles are about to catastrophically shift, causing the crust of the Earth to move 90 degrees. There's also a connection somehow with Planet Zeta about to zoom through the solar system and further throw everything into turmoil. For months, advocates of these ideas have been pointing to reports of cracks in the ground, along with other events, as evidence of the rapidly impending catastrophes. But they also track reports of 'earth cracks' that look in some cases to be similar to the earth fissures we have in Arizona. Cracks in Mexico and Chile could be caused by a variety of factors, but we know of extensive earth fissures in central Mexico that occur in similar geologic and hydrologic conditions as in Arizona. So, it's of value to see what we can learn from these other 'cracks'. We are not endorsing the pole shift and other catastrophe theories (after all, as a state agency, AZGS must be in on the worldwide government conspiracy to hide this info from the public) but there are some folks out there dedicated to tracking down all the reports of earth cracks. That might be a useful resource. It sounds like an old Bob Hope - Bing Crosby movie - "The Road to Miami" but a 285-ton anode furnace for refining copper is on its way from Salt Lake City to the Freeport McMoRan mine in Miami, Arizona. A specially built 225-foot long truck takes up two lanes of roadway. It's expected to cross Hoover Dam Bypass Bridge after midnight next Tuesday and take 8 days to cover the 380 mile trip to the mine. ADOT is warning motorists of delays in the vicinity of the oversized load. The full route and timetable is posted online. AZGS geologist Joe Cook passed along this additional photo of the calf that he and Mike Mahan rescued from an earth fissure yesterday, near Elfrida, east of Tucson. Note the heavier vegetation and tree growing along the fissure, which is common. That draws wildlife and stock to the shade, and hides the fissure from view. The calf was turned over to the rancher. AZGS geologists Joe Cook and Mike Mahan rescued a calf today, that had become stuck in thick mud at the bottom of an earth fissure near Elfrida in Cochise County. [right, Joe rinses off face of calf after pulling it out of the fissure. Photo by Mike Mahan] They contacted the rancher who picked up the calf. Joe and Mike had earlier assessed the damage to Van Ness Road near highway 191, that is being torn up by a pair of giant cracks, one about 225 feet long, and the second about 375 feet in length [left]. Where the cracks are open they can be up to 2 feet across and up to ~6 feet deep (with a narrow crack open at the base and extending deeper). Some areas have a 2-foot wide block slumping into the open space below. 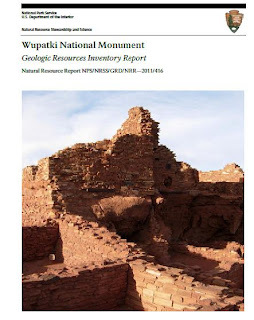 The National Park Service released a geologic report on Wupatki National Monument, northeast of Flagstaff. The 78-page Geologic Resources Inventory (GRI) report "is written for resource managers to assist in resource management and science-based decision making, but may also be useful for interpretation. The report discusses potential geologic issues facing resource managers at the park, distinctive geologic features and processes present within the park, and the geologic history leading to the park’s present landscape. 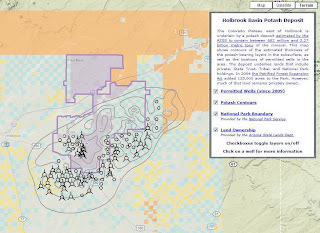 A map unit properties table summarizes the main features, characteristics, and potential management issues for all of the rock units on the geologic map." The GRI reports are prepared by the NPS Geologic Resources Division, which works closely with state geological surveys and universities. The paper started off by declaring "Congress should know better than to mess with a national treasure." "The Desert Sun agrees that more mining is necessary, helping to boost the economy and to strengthen our energy independence, but uranium mining near the river is just too dangerous." Quinn argues that "the environmental premise for this withdrawal is belied by the government's own findings. The Department of the Interior's Feb. 18 draft environmental impact assessment of potential impacts to the Grand Canyon National Park found no compelling reasons to suspect that uranium mining would damage the surrounding environment. Park recreation and tourism “are unlikely to be affected” by uranium mining, said the assessment, nor would aquatic life and water quality be significantly impacted. One big reason is that uranium mining, like all U.S. mineral mining today, is heavily regulated by multiple federal and state agencies."